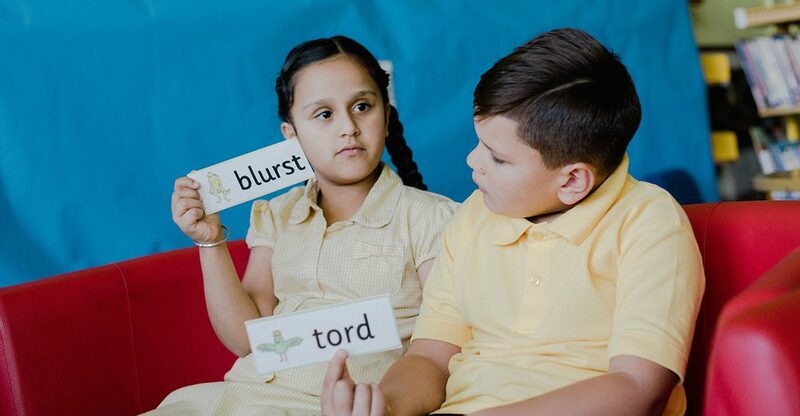 The Phonics Screening Check introduced in 2012 as a ‘light touch diagnostic check’ for all children age about six-years-of-age in primary schools in England has now become a high stakes assessment. DfE expects schools to have a higher percentage of children pass the check each year. Ofsted inspectors consider the percentage of children in a school who have passed the check and a low pass mark can have a detrimental impact on the outcome of a school inspection. The check is a statutory assessment taken by all children in state primary schools at the end of Year 1. The check has 40 words (20 real and 20 pseudo words) which the child is required to read out loud to the teacher. Pseudo words are nonsense words. Those who fail to achieve a mark of 32 out of 40, the pass mark, are required to re-take the check the following year. The School Standards Minister Nick Gibb, remains committed to the check and frequently makes claims for its effect in raising literacy standards in primary schools. In the Conservative manifesto one of the few statements on primary education was that: ‘We will build on the success of the phonics screening check’. The other was a commitment to expect all eleven-year-olds to know their times tables by heart’! The government also insists that the only way to teach reading to all children should be by Synthetic Phonics ‘first fast and only’ claiming this to be, ‘not an unevidenced assertion’. There is substantial evidence, ignored by government challenging both these assertions. There has been no consultation with professionals as to the effects of these policies on the literacy experiences of young children, including those reading with understanding when they sat the check, those with difficulties and those labelled as failing so early in their school career. The dictates of DfE and Ofsted are having a major impact on practice in schools from nursery onwards, and on the content of courses for intending and experienced primary teachers. In our recently completed independent survey we sought the views of teachers and parents on the value of the check as a diagnostic measure and its impact on classroom practice. We also asked the extent to which they agreed with current government policy. Survey forms were returned by 230 Head Teachers, 1,348 teachers and 419 parents. The report of this survey can now be read and downloaded here. The majority of Head Teachers, teachers and parents do not agree with the check and would like it to be discontinued. Many Head Teachers did not feel that the check gave them any additional information about children’s reading. Most Head Teachers, teachers and parents disagreed with the inclusion of pseudo words. It would appear that the pressure placed on teachers to increase the pass mark year-on-year is leading in many schools to streaming and setting for Phonics being introduced from as early as nursery and Reception class often with a focus on pseudo words, as children are prepared for the check. The government should discontinue the phonics check or making it voluntary, or at least cease to use it as a measure of school effectiveness. The pass/fail measure was thought to be unhelpful as was the requirement that children who fail re-sit the check the following year. Many teachers and parents commented on the detrimental effect of the pseudo words. Practice on these dominated many classrooms to ensure a high percentage pass on the check, in spite of the concerns of the teachers whose professional judgement was being ignored. In our report we cite other research revealing the concerns of many teachers none of whose views have been acknowledged.